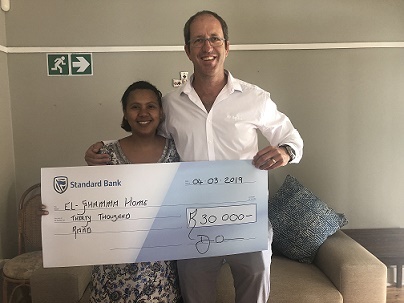 As part of its belief that much of a country’s success lies in the involvement of corporates in their communities, the Goscor Group has extended a helping hand to four needy charities with a R30 000 donation to each of them. That much of a country’s success lies in the involvement of corporates in the communities they operate is no overstatement. Because of the economic power big businesses hold, they are in a position to make a real difference when it comes to helping society deal with an array of challenges it faces. “At Goscor, we believe that business should be an active citizen. This should be motivated by the desire to contribute to building better communities. It is rooted in our understanding that business is not separate from society, but inextricably bound to the fortunes of its people,” says Goscor Group CEO Neil Wilson. Wilson is of the view that any corporation’s CSI initiative shouldn’t be driven by regulation, but by the company’s desire and commitment to the well-being of the society it serves. He adds that companies can exhibit their inherent, welfare-creating strength by means of words and action. By actively tackling issues that affect society, individual companies can show that voluntary efforts are more effective than regulation. “At Goscor, we believe that business is the cornerstone of prosperity in society. Apart from creating jobs, offering goods, services and processes, as well as investing in the skills of our employees, we have always gone the extra mile to make a difference in other parts of communities we operate in,” he says. With that in mind, the Goscor Group has made R30 000 donations to four recommended charities. Three of the benefitting charities are based in Gauteng and one in Cape Town. The three Gauteng charities are Little Eden, TLC Charity and El-Shammah, and the Cape Town beneficiary is The Enez Foundation. Based in Edenvale, Gauteng, Little Eden was started 51 years ago by Domitilla and Danny Hyams with three children and a R10 donation. The charity organisation now has two care centres where it looks after 300 profoundly intellectually and physically disabled children and adults. “At our Edenvale facility we care for 180 children and adults that are totally dependent on our caregivers who are responsible for the activities of daily living such as bathing, dressing and feeding. At our Bapsfontein home we care for 120 residents that are better functioning even though many are in wheelchairs and need extra care,” explains Zai Miller, development officer at Little Eden. Little Eden aims to develop persons with intellectual disabilities to their full potential. “Of our 300 children most were abandoned and neglected or come from indigent families that are unable to care for them or support them financially. The majority at Little Eden are in specially-adapted wheelchairs and need care day and night. We are grateful to Goscor for its helping hand. The R30 000 donation, which we received in December 2018, really went a long way towards our budget,” adds Miller. Located in Primrose, Germiston, El-Shammah Home was officially opened on 13 May 2009. Its main objective and vision is to care for abandoned and unwanted babies from new born to approximately 18 months of age. “The mission of the home is to facilitate a safe and neat home environment where the babies can find a place of love, care and protection and where they can experience true motherly nourishment physically, spiritually and emotionally through full time qualified and trained care givers on a 24/7 basis,” explains Merencia Scholtz, project manager at El-Shammah. At full capacity the three bedroom home can accommodate 12 babies. The past two and a half years have posed a great need for the facility in the surrounding communities as babies are regularly brought into the home by the South African Police Service (SAPS) and various social workers and child welfare organisations. “As a non-profit organisation, El-Shammah Home fully depends on public donations to keep its doors open and deliver the specialised service to precious needy children. Sometimes it is not easy due to limited financial means which constrains the effective operation and vision of the home. We thank Goscor for its donation, which has truly made a difference to the home,” says Scholtz. Located in Bronkhorstfontein, Eikenhof, Gauteng, TLC Children’s Home was founded by the Jarvis family in 1993. It began with the mission to provide a refuge for any baby or child in need of care, whether because they have been abandoned, neglected, orphaned or abused. “While in our care we provide a holistic and individual development plan focused on each child’s unique needs. Today we are one of the most reputable child and youth care centres in Johannesburg and are able to accommodate 32 infants and children under the age of three years old,” says Pippa Jarvis, MD of TLC. To this day, the Jarvis family still plays a huge role, not only in the running of, but also in the environment at TLC. Over the last two and half decades, Thea Jarvis and her two oldest daughters, Joanna and Pippa, have adopted 38 children. With the family home and the nursery occupying different wings of the same building, much of what happens in the nursery intertwines with the family dynamics and vice versa. The family also relies on the generous support of the TLC community to help raise and provide opportunities for the children and young adults that have grown up as permanent members of the Jarvis family. They remain beneficiaries of TLC until they are able to support themselves as independent adults. “We thank Goscor for its R30 000 donation to TLC. The donation goes a long way in supporting our efforts to ensure each child’s stay with us is as comfortable as possible,” says Thea Jarvis, founding director of TLC. The Enez Foundation provides services in substance abuse, which include individual and family counselling, group and employee workshops that are designed to assist the individual, their family members, colleagues and educators. It also assists with the reintegration of the substance abuser into the family system. Providing service in areas like Paarl, Stellenbosch, Somerset-West and Malmesbury, The Enez Foundation is the only resource centre of its nature for families in the northern suburbs of Cape Town. “We believe that education and empowerment of our society as a whole is the only way to positively assist those tormented by addiction and those affected by it. A successful medium is reached when we engage our clients in psycho-educational workshops and thereafter follow up with individual counselling,” explains Shanet Regal, director of The Enez Foundation. The Enez Foundation strives to empower affected families by educating them about addiction and its effects. It also provides support to spouses, parents, partners and children affected by addiction. Its mission is to provide affordable counselling services to families and substance abusers and to offer workshops that highlight the effects of addiction on family members; the impact of it in the workplace; government sector, education systems, including tertiary institutions; as well as churches and communities at large. “Building strong recovery community organisations is one way to break feelings of isolation and shame, build strong relationships and advocate for the solutions that we know work. As a grassroots organisation, we thrive in developing recovery leaders, offer opportunities to express a collective voice and provide a forum for community service. The Goscor donation will definitely go a long way in enhancing our capacity,” concludes Regal.